Ukrainian New Zealand Diaspora — Issuing and the official cancellation ceremony of the world's first postage stamp in commemoration of 75th anniversary of Holodomor - the act of famine genocide in Ukraine in 1932-33. In 2007 UANZ issued the world's first postage stamp in commemoration of 75th anniversary of Holodomor - the act of famine genocide in Ukraine in 1932-33 and canceled on November 24, 2007 in Auckland, New Zealand. 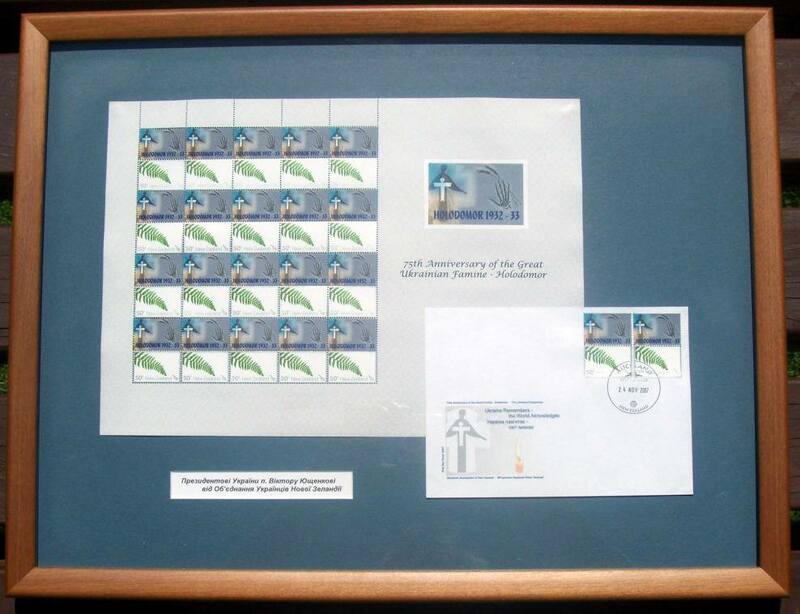 The stamp at the time was quite popular in the philately circles and special edition First Day Cover envelope and stamp sets were gifted to the President of Ukraine, the Governor General of New Zealand, Ukrainian World Congress, the Ambassador of Ukraine to Australia and New Zealand and many others.